What a difference one week makes. Last week I was concerned that the 10-year Treasury note yield had breached its previous cycle peak. I used some questionable, but fancy statistical analysis to justify that the peak I should really be worried about was 3.16% versus the previous cycle peak of 3.04%. I turned to using a regression analysis to see if I could convince myself that there was a higher yield that was more important and that is how I came up with 3.16%. Things dramatically changed last week, however, as economic data came out suggesting some weakness in housing, cracks beginning to appear in emerging market countries as evidenced by exchange rate depreciation, and the need for some countries to significantly raise their interest rates to protect their currencies. 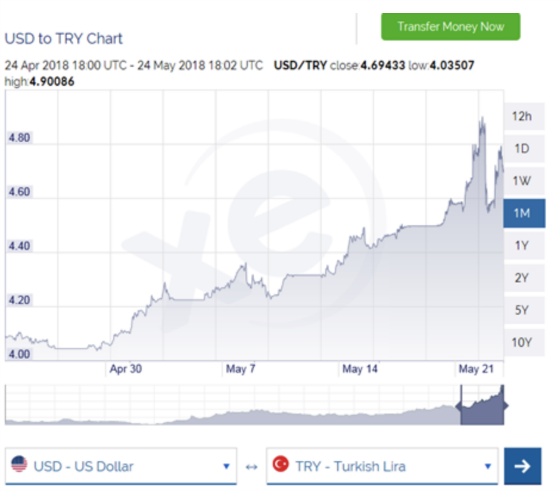 The following chart shows the significant depreciation that has taken place in the Turkish lira in a very short period of time. 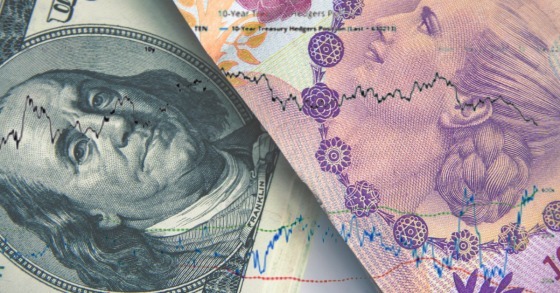 Hong Kong, Argentina, and Brazil are facing significant pressure resulting from a tightening Fed which is helping to strengthen the dollar and leading to outflows from emerging markets to cover short dollar positions who were using the dollar as a carry trade currency. Right now Argentina is the most extreme example as it has had to raise its interest rates to 40% to help defend its currency and it has approached the International Monetary Fund for a loan. Let’s now turn to housing as I find the next chart rather interesting. It tracks the yield on the 10-year Treasury note with a housing ETF. I had been wondering why housing stocks were holding up so well in the face of rising interest rates and thought something would give. Mortgage rates kept the following suit to multi-year highs and yet housing stocks continued to perform well. Either stock prices would drop or yields would compress, or some combination of the two. Upon further reflection, however, the move higher in interest rates and housing stocks made some sense if one believed that higher rates were a byproduct of a strong economy that was creating a lot of jobs, household formations, and the corresponding demand for owner-occupied housing. I was in the camp, however, that the economy was not as strong as the unemployment rate and Federal Reserve officials conveyed. 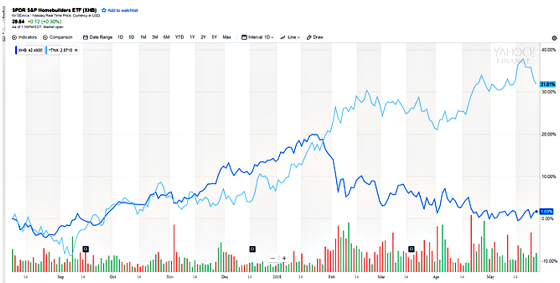 Finally, something gave and it was the stock prices of homebuilders as they have been going through a sharp correction. And now we have finally seen Treasury yields come down. 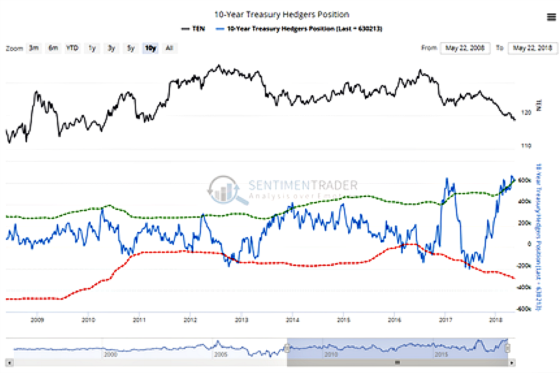 As I have written about recently, the unprecedented amount of short positions in the futures market by speculators positioned Treasuries for a big rally should the right conditions emerge. And last week Treasuries finally rallied fairly significantly. With the 10-year yield closing at 2.93% it has dropped 18 basis points from its closing peak. While I’m not necessarily calling the cycle top at 3.11%, the fact that it decisively dropped below 3.00% was a good sign from my perspective. I was curious to know how this trough to peak cycle (assuming it is complete) compared to previous ones so I decided to go back and look at cycle peaks and troughs since 2000, how long they lasted, and the magnitude of the moves to see if we can learn anything from the last 17+ years. The first table shows the results. I used a minimum increase of 0.75% to classify it as a cycle. The length is calendar days versus trading days. Even without May 17th being the cycle peak of the most recent trough to peak cycle, it is still the longest one we’ve experienced in this dataset. The rate increase has been higher than the average and the median by 40 to 44 basis points. If it reaches the previous high change in rate then the 10-year would have to hit 3.30% (193 basis points from the trough). As an aside, it is interesting to note that, exclusive of this last cycle, six of the ten peaks were hit in May or June. And if we throw April in there then we have 80% covered. Given that the 3.11% was reached in May, then perhaps this was the cycle peak. The last two cycles for both troughs to peak and peak to trough have been much longer than the averages. The following table shows the peak to trough movement in yields and one can see that they have lasted longer and gone down further than the trough to peak. This is not surprising given we have been in a very long bull market for bonds. Like the first table, one can see that the last two cycles have been very long. There does appear to be a correlation between cycle lengths. In other words, when the just completed cycle was long or short, the news cycle tends to be longer or shorter too. If this is the beginning of a down cycle than one can try to use data from the tables above to take a stab at how low 10-year yields can go in the future. With the average drop being 1.70% and the assumed peak yield having been 3.11% then we could be looking at rates as low as 1.41% which is pretty close to the all-time low of 1.37% reached in 2016. If they only drop by the smallest decrease in the table above (0.82%) then we would end up at 2.29%. Only time will tell. Finally, let’s turn to see how hedgers are positioned in the futures market as of May 22. The chart shows that there has been no material change in how hedgers are positioned as they remain extremely long (betting on lower yields). It will be interesting to see next week’s data which will show if positioning changed at all with the big rally in Treasuries. I hope you enjoy your holiday and hope we can all honor those paid the ultimate sacrifice supporting and defending our country. ‹ So Much for That? 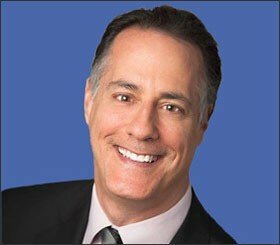 Is The Floating Rate Still a Winning Bet?